Algae growing in mixed media with produced water. Photo courtesy of Paul Laur (Eldorado Biofuels). 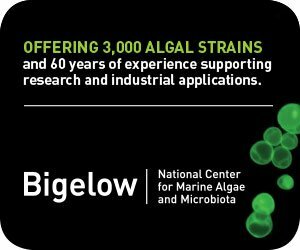 esearchers from Los Alamos National Labs (LANL) and the National Alliance for Advanced Biofuels and Bioproducts (NAABB) consortium have recently conducted the first pilot-scale test of algae growth using water from an oil-production well in Jal, New Mexico. This “produced water,” is pumped to the surface concurrently with the extraction of oil, gas, and coal bed methane from underground formations. Oil and gas production in the United States currently brings about 800 billion gallons of produced water to the surface annually along with the oil and gas. 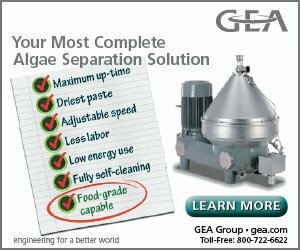 Although the water has characteristics suitable for growth of marine algae, up to 98 percent of this water is routinely disposed as a waste product. These large quantities of saline water have great potential value for algal biofuel production. LANL’s biofuels research intends to demonstrate that algae cultivation need not impinge upon limited fresh-water resources, particularly in arid regions, and can thrive with alternate resources, such as produced water. 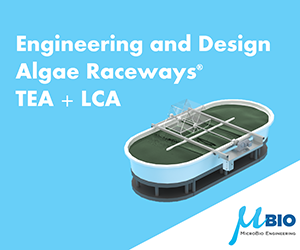 In collaboration with the Texas Agrilife Research facility in Pecos, Texas, the researchers grew a salt-tolerant, oil-producing algae strain in approximately 80-gallon reservoirs. 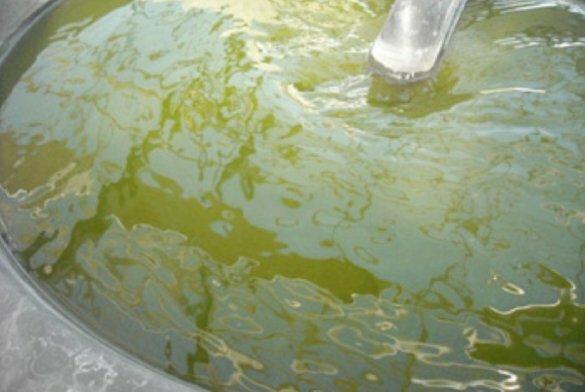 The researchers compared the algae growth in the Pecos city water with that in produced water. Initial growth of algae with low concentrations of produced water was similar to that in city water. However, higher produced-water concentrations of dissolved solids became growth limiting. Testing is set to continue, with scientists adjusting their treatment methods. Researchers include the Laboratory’s Jeri Sullivan, Cindy Dean, Tom Yoshida, and Blossom Cordova of Chemical Diagnostics and Engineering (C-CDE); Mike Rearick of Earth Systems Observations (EES-14); and Greg Wagner of Physical Chemistry and Applied Spectroscopy (C-PCS), along with collaborators at Eldorado Biofuels (Paul Laur, president), Alfonse Viszolay of V.M. Technologies, and the NAABB consortium. The overall goal of the NAABB consortium is to produce new technologies that can be implemented in developing the algal biofuel industry. DOE Energy Efficiency and Renewable Energy funds NAABB through the American Recovery and Reinvestment Act stimulus funding. The work supports the Laboratory’s Energy Security mission area and the Materials for the Future capability.